The Empire State Building is a 102-story skyscraper in Manhattan, New York City, USA. The building was officially opened on May 1, 1931 when President Herbert Hoover turned the lights on with a push of a button from Washington, D.C. The building has 103 floors. There are 6,514 windows in the Empire State Building. 443 meters (1,454 feet) high. The Empire State Building is in the Art Deco style, characterized by decorative, geometric designs. For 41 years between 1931 and 1972 the Empire State Building was the tallest building in the world. The Empire State Building was designed by William Lamb of the architect firm Shreve, Lamb & Harmon Associates. 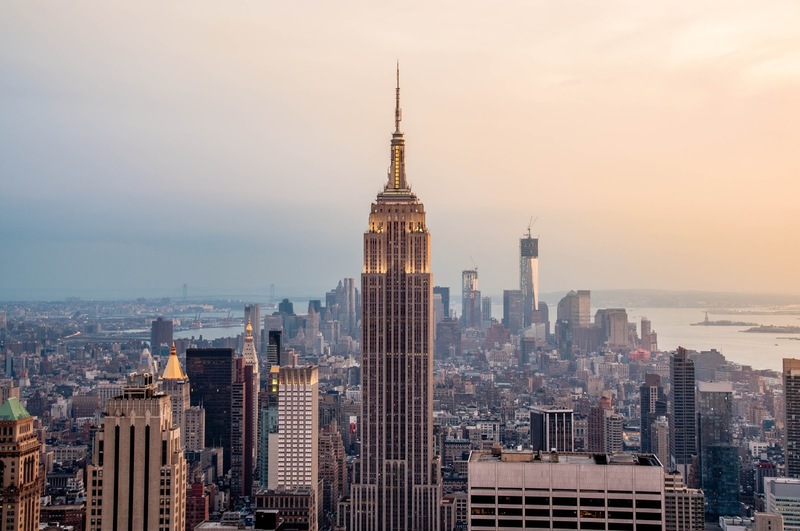 The Empire State Building is made up of 5663 cubic meters (200,000 cubic feet) of Indiana Limestone. The Empire State Building was built in just 410 days, a lightning fast pace as compared to the much slower speed with which modern-day skyscrapers are normally built. The total cost to build it, including the cost of the land was $40,948,900. The cost without the land was $24,718,000. It is believed it would have cost twice as much but because of the Great Depression the price was much less. The Empire State Building was the tallest building in the world from 1931 to 1972. The Empire State Building became the tallest building in New York City again after the collapse of the World Trade Center in 2001.In April 2012 the new One World Trade Center surpassed the Empire State Building in height. In 2011, the Empire State Building became as the tallest Leadership in Energy & Environmental Design (LEED)-certified building in the United States. As of 2015, the building is America’s fifth-tallest skyscraper, and the 30th-tallest in the world. Until the 1960s, the ceilings in the lobby had a shiny art deco mural inspired by both the sky and the Machine Age, until it was covered with ceiling tiles and fluorescent lighting. In 2009, 18 months were spent restoring its aesthetic to the original 1930 design. Over 50 artists and workers used 1393 square meters (15,000 square feet) of aluminum and 120 square meters (1,300 square feet) of 23-carat gold leaf to re-create the mural. From street level to the 102nd floor there are 1,872 steps. A race up the stairs to the 86th floor is held annually, the athletes must climb a total of 1,576 steps. The world record time for the race is held by Australian Paul Crake at 9 minutes and 33 seconds. It has 6,514 windows and 73 elevators including 6 freight elevators. The American Society of Civil Engineers named the Empire State Building one of the Seven Wonders of the Modern World. According to the National Weather Service, the Empire State Building is hit by lightning an average of 25 times per year. In one storm, it was hit eight times in 24 minutes. There are observation decks on the 86th and 102nd floors. These tourist attractions are visited by around 4 million people annually. On a clear day you can see 5 states from observatories: New York, New Jersey, Pennsylvania, Connecticut and Massachusetts. There is saxophonist on the 86th floor observatory Thursdays-Saturdays, 9PM–12AM. The Empire State Building have Multi-Colored Floodlights.The color of the building’s lights changes according to current events. For example, the Empire State Building is lit with red floodlights for Valentine’s Day. The building in the background is the Chrysler Building. At the end of World War II, an Army Air Corps B-25 twin-engine bomber plane crashes into the 79th floor of the building, due to foggy conditions. Only two stories are damaged, but 14 people are killed. The Empire State Building’s 102nd Floor Observatory was originally planned as a check-in area for zeppelins (airships) docked at the tower. In 2011, Cornell researchers analyzed millions of Flickr photos and concluded that the Empire State Building is the most photographed building in the world. Its name is derived from the nickname for New York, the Empire State.